In recent years, cloud computing has been front page news, accelerated by Amazon, Salesforce.com, Yahoo, and Microsoft as they compete for leadership. However, this race for mindshare has obscured cloud computing facts. 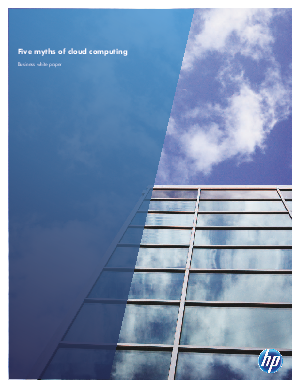 This white paper separates fact from fiction to help senior IT executives make decisions around cloud computing. While dispelling the myths, the white paper answers the tough questions; including how to simplify adopting and securing a private or hybrid cloud. By downloading this asset, you agree that HP and its partners may contact you by phone and/or email about HP's products, services and offerings and other offers that may be of interest to you.